Essential oil scalp massage treatments for hair loss is becoming well-known as a safe and effective natural hair loss remedy. It may sound like a far-fetched idea at first but it starts to make sense when one understands just how essential oils used in aromatherapy can stimulate new hair growth and improve the quality of existing hair. Many people don’t care how it works-just as long as it does work! This article is for those who want know how essential oils work to help improve hair loss conditions. The term “aromatherapy” is misleading. It implies that all the healing power comes from the aroma… as if smelling a certain scent can make one’s hair grow. If that were the case, I too would be skeptical. 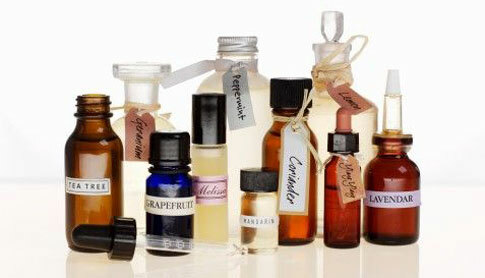 Aromatherapy encompasses the use of essential oils. These are highly concentrated, very potent plant oils. Each tiny drop contains all the molecules and all the vital energy of the entire plant. Each one is intricately balanced with hundreds of natural components that give them their unique therapeutic properties, making them impossible to reproduce synthetically. When essential oils are applied to the scalp, they do not just lie there. Because their molecular structure is minute in size they are easily absorbed into the skin. Once absorbed they immediately go to work applying their therapeutic properties as needed. Essential oils, being lipophillic (meaning they have an affinity for fat cells), allows them to penetrate and dissolve into the subcutaneous layer of the skin, increasing their absorption abilities even more. Another unique trait is that they are one of the only substances that can actually penetrate the cuticle layer and cortex of the hair to facilitate true repair. Their rapid absorption rate and compatibility to skin and hair make them an ideal agent for scalp and hair care. One of the most well known facts about essential oils is their ability to increase circulation. Applying them to the scalp will draw more blood supply to the localized area. The follicles and roots of hair are nourished through blood supply. The essential oils themselves contain all the nutrients of the entire plant in a concentrated form. These nutrients are delivered directly the hair. Hair is often nutrient starved. The hair is the last to receive any nourishment taken in through digestion. It only receives what, if anything is left over after the rest of the vital organs have been nourished. Essential oil scalp massage treatments will help ensure the hair receives an ample supply of nutrients. This alone can make a dramatic difference to the growth and quality of hair. The increased circulation and vasodilating effects of essential oils help to energize and rejuvenate the follicles. Hairs become thin due to follicle shrinkage. The opening and expanding of blood vessels help keep the follicles widened. This helps inhibit the effects of miniaturization. In their widened and enlivened state, hair follicles accept and utilize more of the nutrients they receive. Vasodilation has a stimulating effect on hair follicles, allowing the entire scalp to feel invigorated and energized. This stimulating effect encourages new hair growth. Essential oils have a high level of oxygenating molecules. When used for scalp massage, they transport oxygen to the roots of hair and the cells within the scalp. Certain essential oils have cellular regenerative properties. Since each strand of hair is formed from a clump of cells at the base of each follicle, the cellular regenerative properties of these oils can help keep these cells youthful, healthy and productive. The foundation for healthy hair growth is a clean and healthy scalp. Essential oils have excellent solvent abilities. They are able to dissolve excess sebum, dirt and product build-up that mixes with DHT and clogs hair follicles. The antibacterial, anti-fungal, anti-inflammatory and antiseptic properties help rid the scalp of dandruff and other scalp disorders that can inhibit healthy hair growth. Essential oil scalp massage treatments help keep the scalp clean and pliable, creating the best environment for healthy hair growth. Essential oil scalp massage, used as a natural hair loss remedy can have a profound effect on the health of one’s hair. As long as a follicle is alive and undamaged, there is potential for improvement. As always, it is important to determine type and cause of hair loss and to treat the underlying issue whenever possible.